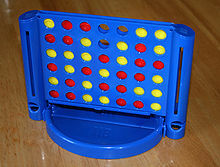 This database contains all legal positions in the game of connect-4 for a 6x7 grid, in which neither player has won yet, and in which the next move is not forced. Thus, every attribute contains a nominal value which describes if a given position is void or if it has been occupied by one player. The task is to predict which player is likely to win the match. This is not a native data set from the KEEL project. It has been obtained from the UCI Machine Learning Repository. The original page where the data set can be found is: http://archive.ics.uci.edu/ml/datasets/Connect-4.